Completing documents with accuracy is vital for the reputation of your business. Many businesses use template contracts that need the client’s name adjusted on each of the documents. Ensuring that each and every name is changed to the client’s name can be time consuming and mind-numbing to the staff member assigned. Luckily, with Microsoft Word you can complete this instantly while also guaranteeing accuracy at the same time. Macros in Microsoft Office 365 Word are commands that are grouped together and run as a recipe in the document. You can use adapt the recipe by changing the inputs (which can be seen as the ingredients in the recipe) such as “Client Name”, “Client Office Address”, “Client Specific Service Agreements”, etc. 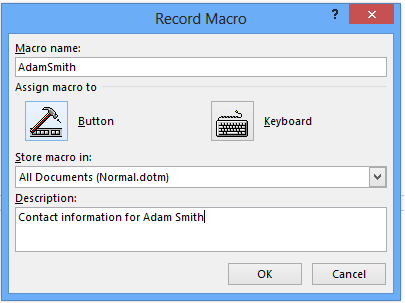 1) Start the recording by clicking View> Macros > Record Macro. 3) Store the macro in “All Documents” so that you may use this macro for different Word documents in the future. 4) Determine how you want to activate the macro – do you want to click a button to start it? Would you rather use a keyboard shortcut? 5) Start the recording and perform the steps you’d like the macro to automate. Do this once perfectly so that the program can learn the process and take care of it for you in the future. Recreating Specific Tables in documents: Macros can be extremely helpful for inserting pre-designed tables into new word documents so that the table retains specific measurements for columns, rows and headers. Usually when tables are imported from one document to the next, they become distorted and lose its distinct formatting settings. Converting documents to different formats (such as paper size, document type): Many reports need to be made available in different formats such as in booklet or PDF form. You can use macros to create a recipe for each document conversion and have the conversions be completed instantly for your future documents. For professionals in Marketing, this can help automate the process of converting flyers to brochures and postcards which can substantially reduce the amount of time it takes to get campaigns off the ground. Save up to $3500 by migrating to award-winning Microsoft 365 products with PropelU Cloud Solutions’ cloud migration experts. Let us take care of the complex implementation process so that you can start using the best productivity tools to move your business forward.